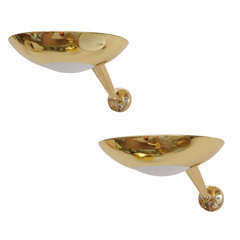 A pair of Farlane double sconces in polished silver designed by Thomas O' Brien and manufactured by Visual Comfort. Each sconce uses 2 candelabra light bulbs with max. 40 watts. The Silver has Patina as shown in the pictures. Can be polished to perfection. 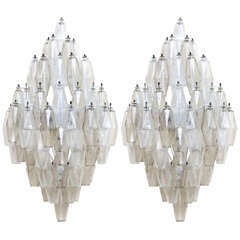 Pair of large sconces with polyhedral shaped ornaments. Designed by Carlo Scarpa for Venini. 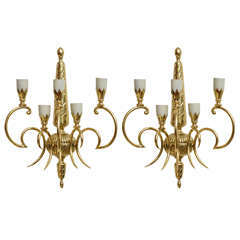 Pair of gilt bronze sconces in the style of Stilnovo with opaline glass and adjustable arms.